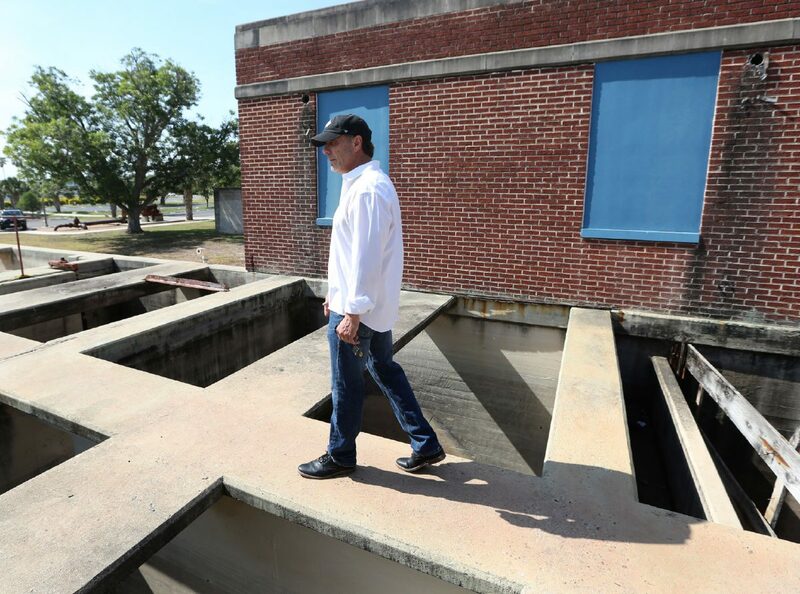 Fred Harms walks on the top of the decommissioned water tanks at the McAllen's Water Purification Plant No. 1 Tuesday, June 5, 2018, in McAllen. Harms has a 20-year lease with the City of McAllen to develop the property into a restaurant venue similar to Harm's University Drafthouse in Edinburg. McALLEN — The vacant, trashed, abandoned pump house — which doubles as a bomb shelter — on the corner of 2nd Street and Business 83 will receive a multi-million dollar overhaul. Fred Harms, part owner of Santa Fe Steakhouse, University Drafthouse in Edinburg and other restaurants in the area, recently struck a deal with the city on the former Fireman’s Park Water Purification Plant No. 1 to turn it into University Drafthouse McAllen. The city leased the land and the building to Harms for 1 dollar per year for 20 years, according to the agreement. Subject to the agreement, Harms has to invest a minimum of $750,000 on improving the building. Of that amount, the agreement says no less than $550,000 needs to be spent on effective waterproofing, ventilation systems and various other improvements to comply with city code. Hitting that number won’t be an issue — Harms estimated he’ll spend likely $2 million in renovations, potentially $3 million. The repurposed site will be called University Drafthouse McAllen, set to open in July 2019. It will feature a full service bar upstairs with capacity for about 150 to 200 people, Harms said. That bar will open up to a large, mostly covered patio. The old, sturdy stairs will lead down to a room mostly reserved for private functions, Harms said. There will be a bar down there as well, but in order to enter, those stairs will not be usable, per Americans with Disabilities Act standards, Harms added. Another entrance will be created outside, with a ramp and stairs, but the current stairs will stay intact to preserve history and character. A full-service kitchen will make a similar menu as the Edinburg location, focusing on hamburgers. Brunch will be served on weekends. Harms also predicted sales will exceed the Edinburg location. For now, the building needs a lot of work. A month into acquiring the key to the building, Harms said his team has already cleared a bit of asbestos, and deep cleaned the building, but there’s much more to do before full construction begins, likely in the fall. Also contingent in the agreement is Harms has to build a larger parking lot between the building and the train tracks that run along Business 83. Inside the building, he plans to keep the pipes, stairs, old machinery and much of the historic aspects of the plant that was built in the 1920s to produce a half million gallons of water per day for 6,000 residents. The building was decommissioned in 1998. While Harms’ plan is in motion, this isn’t the first time the city had an agreement with a local tenant to take over the building. The city inked an agreement with the Sal Del Rey Brewing Company a few years ago, but the deal flopped. Mayor Jim Darling said years ago the city discussed a possible tequila distillery with a group from San Luis Potosi, but nothing panned out. Harms, however, is interested in bringing a brewery or distillery to the facility at some point. There will be a large open space underneath the eventual patio at the drafthouse. Harms also wants to partner with the city on as many events as possible. Harms wants to beautify the grassy area surrounding the building, too.